Kim Mitchell is the Chief Communications Officer at the Museum of Modern Art, in New York City. Under her leadership, MoMA has established one of the most robust and impressive social media approaches in the museum world. But Kim continues to seek out ways to push the envelope, to take chances and to increase both the breadth and diversity of the MoMA audience. Museum Revolution had a chance to catch up with her this week. MoMA has one of the most active social media approaches in the museum world. What’s the driver behind MoMA’s social media work? MoMA is fortunate to have built a total social footprint of some 7.5 million followers. From the beginning, our strategy has been to speak in conversational tone about our program, but not exclusively so—we share interesting topics in the world of culture at large, and take the time to listen and respond. We try to give our followers special access to the museum’s program and staff, whether through a curator-led live video tour of the galleries or a behind-the-scenes Instagram takeover by an artist. It’s like being a good guest at a party—we want to contribute to a lively dialogue in a constantly changing landscape. You will be speaking at Agenda’s Communicating the Museum conference in Quebec in November on this topic. What made you want to cover this topic? We have been working hard over the past few years to clarify MoMA’s ambition as an organization, to more clearly define our audiences, how to meet their needs, and to communicate and measure the impact and value of our work, especially in this era of information and visual overload. That strategy and research is now resulting in a few pilot projects that I will talk about, and we’re eager to see the response. What do you think is going to be the biggest change in the next five years for museums? The biggest challenge for all art museums is to demonstrate continued relevance in our image-saturated visual culture. For young people who get their art preferences delivered instantly via an Instagram feed, the prospect of planning a trip to a museum can be daunting. We need to deliver an immersive experience that starts with the artistic object, performance, film or installation, but also encourage learning beyond looking—people want to understand the social, political and historical context as well as the aesthetic. 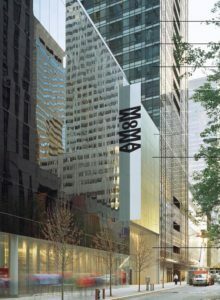 Are there misconceptions about MoMA that you think can be solved for by brand messaging? Brand messaging, as traditionally defined in paid marketing channels, is necessary to be visible and to stimulate interest, but is less effective in addressing misperceptions in today’s complex media environment. I believe that misperceptions are best addressed first by taking actions that demonstrate the organization’s intent, and by communicating those actions in an authentic, conversational, and inclusive way. If you could go back five years, what advice would you give yourself? To be less afraid to use instinct as a guide. If a little red flag keeps going off in your head, it’s generally a sign that something isn’t right, even if others are saying otherwise. Communicators generally have good antenna, and we need to ask the hard questions without fear. Kim will present the keynote “MoMA – Engaging a new generation of culture lovers” at the Communicating the Museum Conference (November 15-19, 2016) in Québec. The Communicating the Museum conference focuses on where museum communications and marketing are headed, and showcasing the groundbreaking efforts that are underway. For more information on this conference, check out their offerings here.